Author(s): Sanghyun Seo, Kyunghyun Yoon. Article: The Visual Computer, Vol. 26, No. 6, pp. 421--431, 2010. We analyze characteristics and patterns of color juxtaposition and the color theory used by pointillist painters and employ them to create rendering algorithm that generates images in a pointillist style. We determine the distribution of colors in several paintings by Seurat and quantify a number of the theory that he employs. 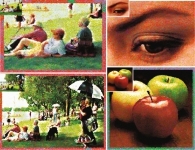 Using an RYB color wheel and a hierarchical point generation technique, we convert an input image into a set of colored dots, which is again converted into brush strokes with appropriate shapes and directions. We present images which illustrate the extent to which we have managed to simulate Seurat's technique.